Remember the Russian folk tale of the three weary soldiers journeying home from war…hungrily they ask for food and shelter, the suspicious townspeople refused them any sustenance. As a final request the men ask for simply a pot of water to cook a magic stone soup with. This they were given. With curiosity the people watch as the men begin to cook mere stones. “This will taste even better with a touch of onion” comments one soldier in an off-handed manner. Eagerly, one of the townspeople runs off to retrieve some onions from their Winter stores. The stones are really bubbling up a magical smell now. Ingredients are subtlety suggested to add ‘just the right touch’ to the Magic Stone Soup. Finally, the ‘stone soup’ is ready to eat, filled with herbs, potatoes, a variety of vegetables and spices. A hearty brew for all. Magic! Well I feel like that with my soup broths. They just get better and better all the time. Today I took Bone Broth to a new level of wild nutrition. 1. Happy chicken or other meat carcass, chicken heart, liver, even the chicken feet. Collagen, gelatin and glucosamine are important building blocks to joint, bone and connective tissue health and chicken feet is high in all three. My friends raise their chickens in the healthiest way possible, organic feed, rotating chicken pens to fresh grass and weeds… I call them happy chickens! Their meat is free of antibiotics that regular chicken feed lots need to give their poultry to combat their disgusting growing environment. Hormone free as well. You really can not get health from a sick animal. 4. Wild roots: Burdock, Evening Primrose, Queen Annes Lace, Dandelion, Astragulus… I keep jars of dried roots in my kitchen to throw into the stock pot. 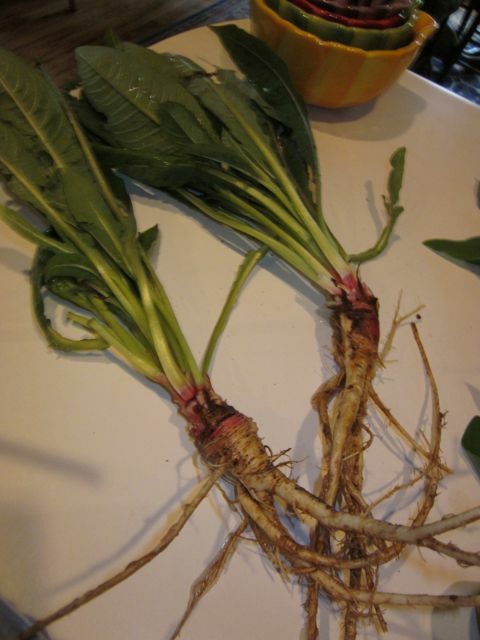 The best time to collect roots is in the Spring before the plant sends it’s energy into the leaves, stalks, flowers etc… and in the late Fall after a good frost to zap the energy back to the roots to store through the cold Winter months. Dig up and stock up! 5. Used herbs from my herbal infusion and any unused teas. I drink a daily Nettle, Raspberry and Oatstraw herbal infusion (strong tea) and these herbs I just toss in for the heck of it. 6. Water used to cook veggies, wild and cultivated. I keep a half gallon jug in the refrigerator to pour off the water from cooking green beans or milkweed. This I use as the liquid to cover the bones, roots and vegetables with. I also use left over tea from my daily infusions. 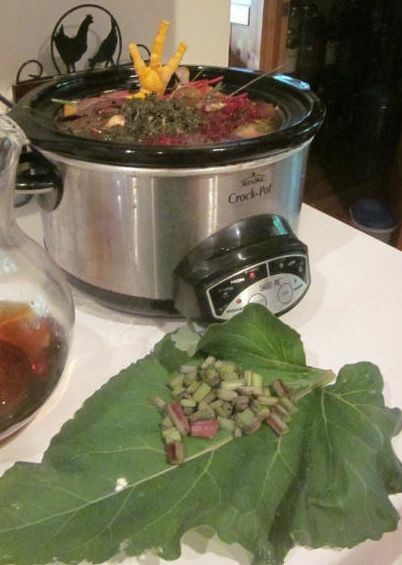 I like slow cooking these wonderful ingredients for up to 24 hours. A crock pot works great for this. Add more liquid if it simmers down too low. Add a touch of vinegar to aid in extracting even more of the vitamins and minerals from the plants. Each ingredient adds so much in nutrition. Wild foods are 4-7 times higher in nutrition than cultivated ones AND the enzymes are fresh since they were just picked! Nothing goes to waste when I’m making my ‘Stone Soup’! After hours of melding the flavors and nutrients together I then pour off the liquid into mason jars to keep till I make soup. I hand pick out pieces of meat that were on the bones to give to Skipper, or if there is enough meat I’ll save it for soups or casseroles. I’m toying with the idea of making dog food with the leftovers (minus the egg shells and bones) but that is subject for another blog entry…. These broths are the basis for the nourishing soups I love to make. I try to not season the stock, saving that instead for the soup itself…depending on the cuisine. Adding ginger and Bragg’s Liquid Amini Acid for an Oriental base. Basil for my famous Tomato soup. Cumin, Oregano and Chili powder for Mexican soups…. Jewish mothers took pride in their Chicken Soups for the soul, and I can see why. I bet everything & the kitchen sink went into the making of their nutritious healing broths. I’ve come a long way from the cubed bouillon days of my past! Below are a few nutrition facts to encourage you to go WILD! I got these nutritional facts from Linda Runyon’s important book, The Essential Wild Food Survival Guide. Dr. James Duke did the nutritional breakdown for 1/2 cup of each of Linda’s 52 most common wild weeds. Lambs Quarters: High in Beta Carotene 3800ug, Calcium 324mg, Potassium 684mg, and Iron 1.5 mg (more than spinach!). 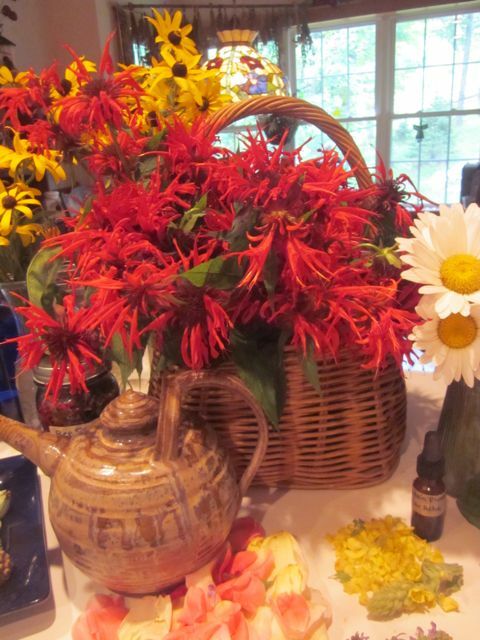 It is also high in b-complex vitamins and vitamin C 40 mg.
Monarda fistula didyma in my basket! Their taste is fantastic! A word of caution: Never consume a plant that you are not 100% sure of it’s identity! 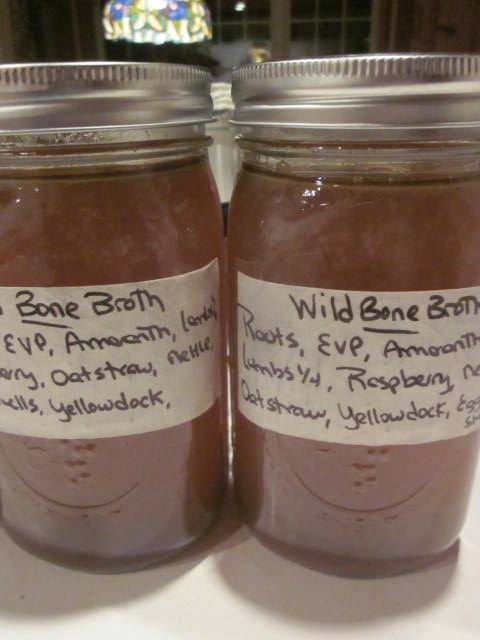 I am so in love with making wild bone broths. It is truly the key to GREAT soup and over the top nutrition. 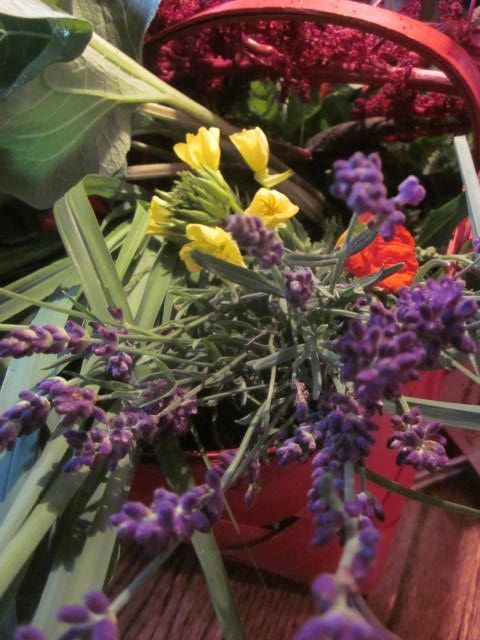 Lately, I’ve been enjoying adding stuff that would ordinarily go in the compost bin. Cabbage cores, egg shells for calcium, celery bottoms, onion skins, egg plant skins, chilantro stems, green bean tips…. Why not the nutrition is there and I strain that stuff out anyway! So cool! My Mom has been quite ill, so I brought her home with me to nurse her back to health. On the menu daily have been my over the top soups made with the base of these amazing stocks. Of course the key ingredient is those Chicken feet! Jewish mothers can tell you that! It’s working, Mom will be going home tomorrow, with an arsenal of soups ready made to heat up for her meals. that comment on Jewish moms was interesting. 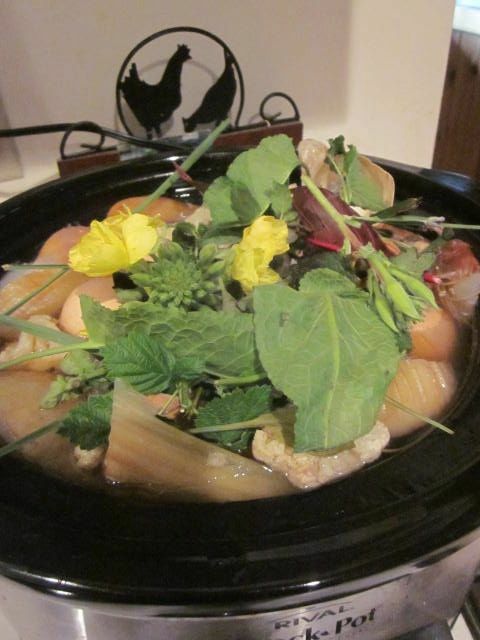 I am Jewish, and I have always wondered how all of our ancestors managed in all the times of our persecutions throughout history…..when I realize that the food which was available in Europe, before and during the hard times….pogroms, holocaust, etc, we made bone broth and chicken soup as some of our staples (and, look up what PTCHA is ! ), I can’t help but think that through that, G-d helped sustain some of the people. thanks for that mention. Beautiful website by the way. We are very into our lambsquarters, I made a wonderful vegetable sauce with it and we poured it over our quinoa for supper. Best wishes and blessings. Wow I just looked up PTCHA! Interesting! I would like to learn how to make it. Sounds so nutritious but to be honest…not very appetizing. Still, I am a stickler at making the most of every morsel of food and this would fit that bill. Thanks for sharing!